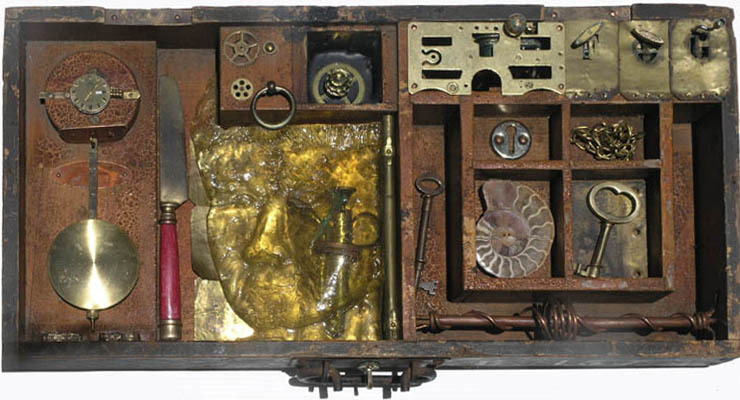 cast face, music boxes, brass & tar, copper & fear. Behind brass stencil plates spelling F O G there are music boxes. Pull the string and turn the handles, there's a cacophony of mixed memories, fading away. The last one left playing is Brahms lullaby, and that frightens me. The babylike loss of thought. The little cut crystal sphere embedded in the tar is perhaps the last coherent thought.